Be the first to share your favorite memory, photo or story of Milford. This memorial page is dedicated for family, friends and future generations to celebrate the life of their loved one. 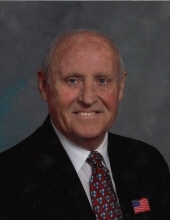 Milford E. Taylor age 87, of Whitesburg, passed away Sunday, March 17, 2019 in a local hospital. He was born July 5, 1931 in Carroll County to the late Willie Lee Taylor and Mary Lillian Cowart Taylor. Milford attended and graduated from Whitesburg High School and attended Berry College before serving his Country in the US Army. Following his discharge Milford began a career that spanned over 35 years with the Georgia Power Co., following his retirement he remained in touch with many of his Georgia Power co-workers by joining the Georgia Power Ambassadors. He was a man of strong Christian Faith and conviction and a part of the worship family at Mt. Pleasant Baptist Church where he was a Deacon. In addition to his parents, he is preceded in death by his first wife Vivian Irene Bradford Taylor; brothers, Willie Taylor, Ray Taylor and two infant brothers; and three sisters, Clera Cook, Reba Taylor, and Lilly McGuire. Survivors include his wife Mary Willene Duke Taylor; children, Sherryll Miles (Freddy) of Whitesburg, Kathy Yates of Carrollton and Deborah Powell (Steve) of Augusta; four sisters, Edna Key of Carrollton, Jackie Wright and Judy Sanders both of Whitesburg, and Betty Key of Carrollton; brother, Calvin Taylor of Carrollton; also surviving are seven grandchildren; Casey Hight, Meagen Thompson (Mono), Emily Yates, Robby, Brad, Anthony and Kate Powell, two great grandchildren: Morgan and Maxwell Thompson. Funeral service will be conducted Wednesday, at 11:00AM from Mt. Pleasant Baptist Church with Bro. John Lemmings officiating. Graveside services will follow in Ephesus Christian Church Cemetery with Bro. Steve White officiating. Pallbearers will be Robby Powell, Brad Powell, Danny Jiles, Freddy Miles, Chris Huddleston and Jarvis Taylor. Honorary Pallbearers will be Wendell Carnes and Members of Georgia Power Ambassadors. The family will receive friends on Tuesday from 5:00 until 8:00PM at the funeral home. In lieu of flowers the family asks that memorial contributions be made to the Mt. Pleasant Baptist Church Building Fund. To send flowers or a remembrance gift to the family of Milford Earl Taylor, please visit our Tribute Store. "Email Address" would like to share the life celebration of Milford Earl Taylor. Click on the "link" to go to share a favorite memory or leave a condolence message for the family.